AMMA has submitted a compelling case for workplace relations reform to the Productivity Commission, based on the evidence and recommendations of our members as to how Australia’s workplace system could better support them in the productive and competitive running of their workplaces. AMMA’s submission to the Productivity Commission’s ‘Review of the Workplace Relations Framework’ clearly identifies the challenges faced by our members under the Fair Work Act 2009. It builds an undeniable case for reform and specifies what changes would lead to practical, valuable outcomes making a real difference in how our members operate on a daily basis. Click here to read AMMA’s Submission – Getting Back on Track: Delivering the Workplace Relations Framework Australia Needs. Importantly, given the Productivity Commission’s emphasis on evidence-based submissions, this submission is accompanied by a groundbreaking research report that AMMA commissioned to KPMG. 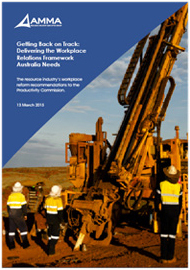 This report quantifies the potential benefits to the resource industry and Australia’s broader economy and employment if our reform options were successfully implemented. Click here to read the KPMG report – Workplace Relations and the Competitiveness of the Australian Resources Sector.